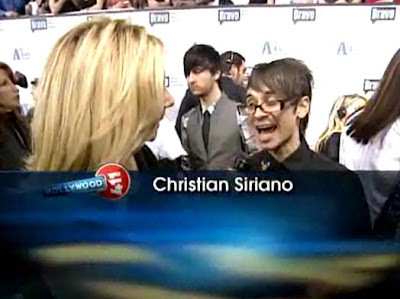 Click here for an interview with Christian Siriano in What's Up? Thanks Chris. Click here to submit your questions for an upcoming interview with Tim Gunn in Time Magazine. Thanks Orli. Click here to visit our Shear Genius blog and to read our exit interview with Oshun. Click here to download the application. Deadline is July 9th. Good luck designers! Laura Bennett and Mychael Knight unveiled new dress designs at the one-year anniversary celebration of alli. "Dress For Success" received a large donation. Click here and here for more. 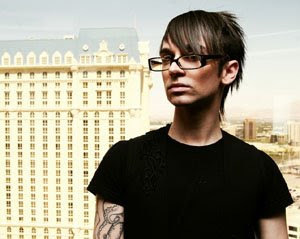 Christian Siriano recently appeared at a charity event in Seattle. Also from Seattle, the brand new Bossi and Ish Ky boutique is carrying Rami Kashou designs. Don't miss Heidi Klum tonight on QVC. Click here for the schedule. "Real World" producers, Bunim-Murray are in discussions with The Weinstein Co. about producing season six of Project Runway. Amy alerted us to these ads that are running on Craigslist. They are running in every market, even here in Phoenix. Designers, please let us know if you follow up on this - thanks! Tim Gunn is exasperated over that second button. Here he describes why Heidi Klum always looks so great and offers some summer picks and pans. Project Prom winner wears her custom-designed Jillian Lewis dress on the big night. Click here for more. Iman returns as host of Project Runway Canada. Taping begins this summer in Ottawa. Project Runway Australia premieres on July 7th. Click here and here for more from Nick. Our friends at BellaSugar have posted a great interview with Heidi Klum. Click here to discover Heidi's beauty advice. Click here for Heidi's style interview on Fabsugar. Lilsugar has Heidi's parenting advice. Meanwhile, Buzzsugar is running a poll to determine the favorite season of Project Runway so far. No Runway fans, it's not July 16 quite yet but we're dusting off the TGIW machine to celebrate the Season 2 premiere of Shear Genius. Tbone has crawled out from under his rock and will be hosting a party post tonight over at Blogging Shear Genius. All of you party animals can join the fun beginning at 9:00 p.m. Eastern. Come say hello! Meanwhile, look at Jaclyn Smith up there. She is apparently ageless, looking no different than she did 30 years ago. It's ridiculous. Also, don't miss this fabulous field report from Trish the Dish yesterday as she attended the Shear Genius Blowout event in Times Square. Jack Mackenroth and Heather Tom looking cool and adorable on the red carpet. This dress is now available for your bid at Clothes off our Backs. "Days of Our Lives" star, Shelley Hennig looked stunning in this Nick Verreos design. Nick also provided fashion commentary for Soapnet.com. Click here for more from Nick. Don't miss the video links! 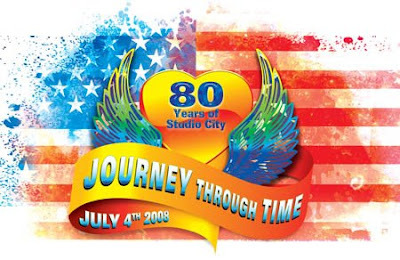 Sweet P will be among the celebrity guests at the Studio City Fourth of July Fireworks Festival. Click here for more information and to purchase tickets. Click here for a charming video preview of the episode. 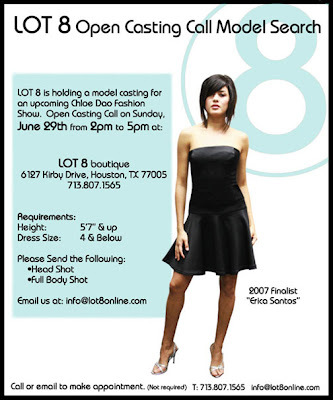 Houston-area models, please note the open call on June 29th from 2:00 - 5:00 at Chloe Dao's boutique, Lot 8. For more info write to Patrick. 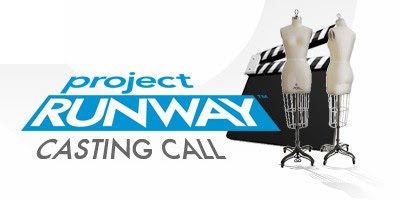 The Season 5 promos are beginning for Project Runway. This one features the song You Made Me Like It by the band 1990's. A bit over three weeks ... in case you're counting. Looking forward to this trainwreck? Congratulations again to Christian Siriano and Lisa Sole for their fabulous "Spread in Elle Magazine." The July issue is on the newsstands now. Click here for more. Thanks Lisa. Click here for photos of Malan Breton with the finalists from Australia's Next Top Model. Thanks Jason. Please check out our new site, Blogging Shear Genius (please take our poll!) The season two premiere is on Wednesday night. Project Runway Season Four finalist Rami Kashou talks with Daphne Brogdon and Lawrence Zarian, The Fashion Team from the TV Guide Channel. Click here to watch a sneak peek of next week's episode of Australia's Next Top Model. The final three girls are modeling Malan Breton's designs at a retrospective of his work in NYC. 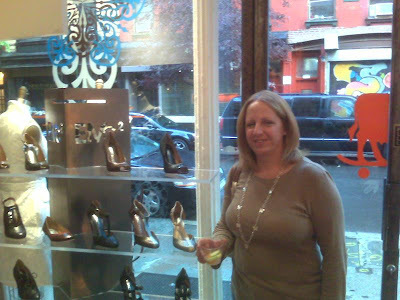 NYC-based field reporter, Trish O, was at Emmett McCarthy's Shoe Sale on Wednesday night. Here is her report. Thanks again Trish! Well - a tough and demanding school year has come to an end and after all the work I put into it, I decided that my "sole needed some saving!" so I took a trip into New York City to Emmett McCarthy's "Who Will Save Your Sole?" shoe sale at his EMc2 boutique on Wednesday night! Every time I visit the store, the displays are so different and quite striking. This time the focus was of course - on the shoes! Here is Heather in her custom-designed Jack Mackenroth gown. What do you think? Daytime Emmy Awards Presented Tonight! The current issue of Star magazine (with Angelina on the cover) includes this feature about Jack Mackenroth and Heather Tom. Check out the red carpet Emmy coverage to see Heather in the dress. Click here for more info. Also, Nick Verreos will provide Red Carpet Style commentary for Soapnet.com. Be on the lookout for Heather, Nick! Could this be a Season Five designer? Say hi to Blayne. Thanks Violet. NYMag's The Cut has a new interview with Tim Gunn. Thanks Jill. Only a couple of hours remain on the A-List auctions. All proceeds go to UNICEF. Good luck everyone! Reports that Season Six will film partly in Los Angeles have brought mixed reactions. Devoted fans want nothing to change about their beloved show. Forward-thinkers are eager to see something fresh and new. The truth is that there has always been a strong Los Angeles presence on Project Runway. Auditions are held there every season and there has been at least one Los Angeles designer in the finale of every season so far. Variety has an interesting article about the personality of the Los Angeles fashion designer and how he or she might be perfectly suited for the reality show format. Meanwhile, speaking of Los Angeles designers. Don't miss all of the great new material on Nick Verreos's blog. 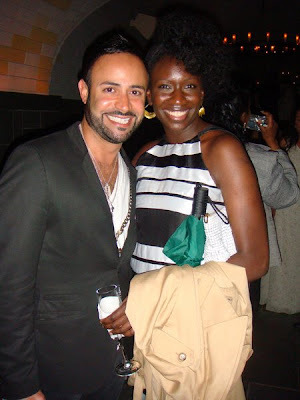 and click here for a post about Nick, Zulema and the A-List afterparty. Project Runway has been nominated for a Teen Choice Award! More info here. The court hearing on NBC/Universal's lawsuit against the Weinstein Co. has been delayed. Tonight is the Summer Shoe Party at EMc2. Kara Janx is holding a sample sale on Friday and Saturday. Click to enlarge the image above. 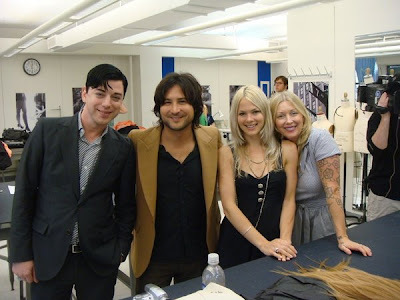 Project Runway Season Five News! Tim Gunn, Heidi Klum, Nina Garcia and Harvey Weinstein at the Peabody Awards! The Jay McCarroll documentary, Eleven Minutes received a rave review from Variety! Click here to see the schedule of future screenings including Los Angeles, Philadelphia and New York. There are only two days left to submit your entry to this contest. Send in a photo of yourself that portrays your true ferocity and tell Elle, in 250 words or less, why you are fierce, fabulous, and flawless enough to win. What sets you apart? What inspires you? How do you plan to leave your mark? The prize is this original Christian Siriano dress. Good luck! Heidi Klum was joined by Austin Scarlett, Chris March, Christian Siriano, Jane Cha and Desiree Gruber at the Peabody Awards After Party. Read more here. Kevin Christiana designed a gorgeous dress for Time Out New York and Yahoo! entertainment reporter Lauren Scala. Click here for video of the design process as Kevin and Lauren visit Mood Fabrics and have a design consultation in Kevin's Studio. 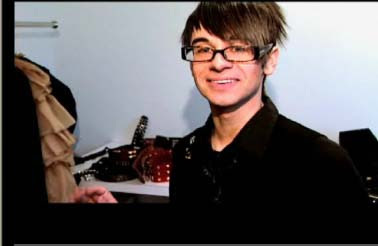 Who is New Chris and how is he related to Project Runway? New Chris is actually Chris Keslar, friend of BPR and brother to none other than Season Three designer Angela Keslar. Chris had served as a 'field reporter' for us when Angela was at Macy's (click here). 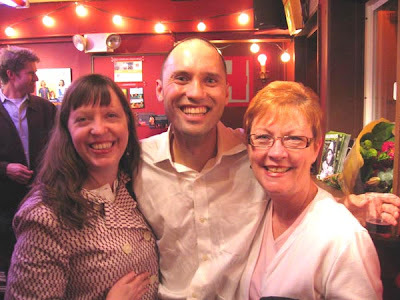 And he also joined Laura K. with Heather Ashton and Andrea Keller from Top Design (more colliding!) at a lunch at The Standard Hotel during casting of Season 4 of Project Runway (click here). 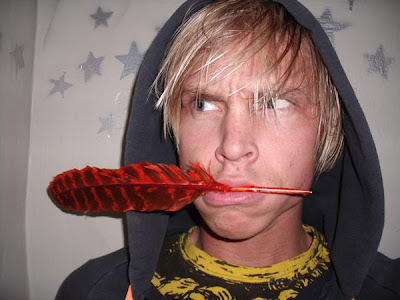 Just wanted to give Chris a shout-out on BPR and say that we can't wait to 'watch what happens' on the new season! Looks like Heidi Klum has a new tattoo. Click here for more info. Bravo's A-List Awards Show was a ratings success! Let's check in with the Project Runway "All-Stars" auctions. Can you guess which dress will receive the highest bid? Rami Kashou will be on TVGuide Channel's Fashion Team tonight. He will be showcasing five current looks from his collection along with his HSN design. Click here to check your local listings. The 67th Annual Peabody Awards luncheon was held today in New York City. Heidi Klum, Nina Garcia, Tim Gunn and Harvey Weinstein joined "producers" and "other executives" in accepting the award. Now that must have been awkward. Read more here. 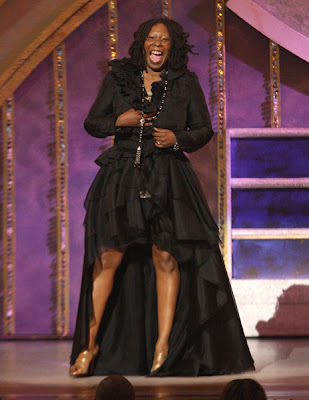 Whoopi in Christian Siriano - Fug or Fab? By the time I realized that I should post a poll about Whoopi Goldberg's Christian Siriano dress worn last night at the Tony Awards, I figured that I should check out The Fug Girls to see if the frock merited a mention. Yes, the gown was not only discussed but they also posted a far more clever poll than the one I had considered. So go vote over there - but, since they don't allow comments, tell us why you voted the way you did. Tune in to the Tony Awards ceremony tonight to see the Christian Siriano design that Whoopi Goldberg is expected to wear. Update: Click here to see the dress. Here on the west coast we have a couple of hours until the show airs. I don't want to spoil things, so don't click if you want to be surprised! Emmett McCarthy is having a shoe sale on Wednesday night. RSVP to (212) 431-4134. Sounds like fun! Christian and Lisa are in the July issue of Elle magazine! Click here for behind-the-scenes video! 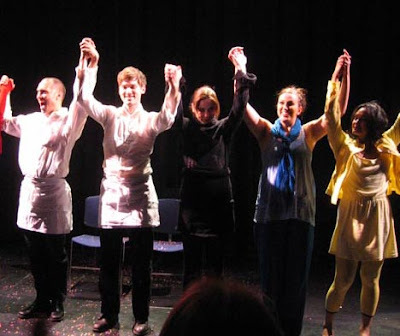 Los Angeles-based Field Reporter Christine Haynes covered the "Go Metro" dance performance for BPR. Thanks Christine! 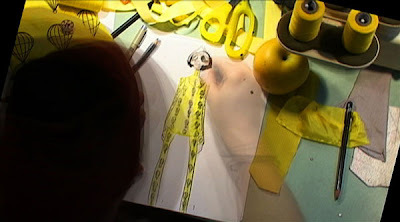 Last Saturday I went to see Project Runway Season 2's Andrae Gonzalo perform Go Metro . . . at the Highways Performance Space in Santa Monica. The timing couldn't have been better, as my mom was in town for the long weekend, and she is a super Project Runway fan, so she was really excited to meet Andrae. So off we went, and it was so great! Andrae, and a cast of about 6 others performed a series of really funny dance/performances all about the joys and pains of taking public transportation in LA. Afterwards, we went to meet Andrae, and he graciously posed for a photo with us. He was extremely genuine and sweet. And we met his mom, who we ended up sitting next to during the performance. She was lovely as well. Who do you call when you want a dress fashioned out of money? If you're Heidi Klum, posing for the June 30 Forbes Magazine (on the newstands today), you don't hesitate to think of Project Runway Season 4 Finalist Rami Kashou. Rami tells us that he created the dress in two days and was on the set prepping the entire day of the shoot. You can also see Rami and the leggy supermodel in the table of contents. UPDATE: The money was fake and purchased at Toys R Us! Fantastic! You can now bid on dresses and sketches by Project Runway designers and also help the efforts of UNICEF in their Myanmar relief mission. Click here for all of the auctions which include garments by Nick Verreos, Malan Breton, Mychael Knight, Laura Bennett, Sweet P, Chris March, Alison Kelly and Daniel Franco. Laura K. interviews the stunningly beautiful Carmen Webber of Project Runway Season 4. She talks about, among other topics, her modeling career and how she parlayed that experience to become a fashion designer and author. Click here for the podcast. You can order Denim Mania and T-Shirt Makeovers . You can also visit her Sistahs of Harlem site for the very latest in Carmen Webber news. Besides the news that the show will premiere on July 16th and air at 9:00 PM, we have several more tidbits from today's press release. First, Nina Garcia and Michael Kors will be back, along with Tim Gunn and Heidi Klum. Nina is described as a "Fashion Expert" and no magazine or sponsor is mentioned. Red carpet coverage with Tim Gunn is scheduled for 8:30 - 9:00 and then Kathy Griffin's "My Life on the D-List" is at 9:00 and the A-List Awards Show is at 10:00. Meanwhile, Forbes magazine features an excellent article on Heidi Klum and her extraordinary business acumen. It looks like Heidi will be shopping for a new apartment. Christian Siriano has designed a t-shirt to benefit HRC.org. It's official - Season 5 of Project Runway will premiere on July 16 at 9:00 Eastern. Heidi Klum is on the cover of the July issue of Redbook magazine. Now I'm dying to learn the "One thing that is missing in her life..."
Attention Washington DC: Christian Siriano will be in town on Friday night. Click here for more information. Gawker reports on what it takes to sign on as a magazine sponsor of Project Runway. Click here for the Portfolio.com take on the A-List Awards. Click here to watch the TV Guide Channel's coverage of the Red Carpet at Bravo's A-List Awards. Tim Gunn will provide fashion commentary on Thursday night. Click here for a new interview with Nick Verreos in StyleInterviews.com. 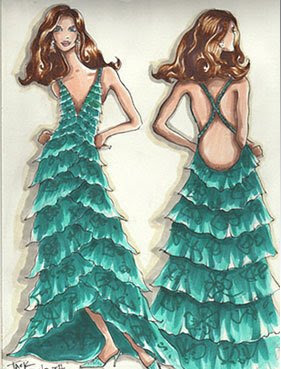 Click here for more about Jack Mackenroth designing a gown for Heather Tom. I can't wait to see this! Sweet P has a blog update. More from the A-List Awards on After Elton.